The logistical challenge of coordinating natural resource management actions across large scales is typically complicated by the diversity of stakeholders’ interests. Devising a plan is difficult. Getting diverse stakeholders to agree to and adhere to any logistical solution is harder still. Hence logistical solutions to large-scale problems involve a combination of coordination, and trust-building and contestation which are two key features of collaboration. We studied networks based on stakeholder participation in institutional responses to agricultural pest and disease incursions, where the spatial complexity of response is further challenged by the need to design and implement plans quickly in order to stop the spread of incursions. Using data from the 2010 Australian myrtle rust incursion, we used novel statistical network methods which showed that policy forums at national scales, where higher-level decisions are made, were associated with denser overlapping stakeholder interactions signifying collaboration (bondingcapital, high transaction-costs). Our qualitative data unpacked this, showing how at times uncertainty in process and information is used by some stakeholders to contest decisions at national scales. We failed to find statistical evidence that at local scales, where plans are implemented more-or-less at face value, networks exhibited lower-transaction cost interactions associated with the socially cheaper task of coordination (bridging-capital, low transaction-costs). By identifying the mix of coordination and collaboration in networks for solving environmental problems, capacity building can be more targeted, and rules-of-behaviour can be developed that better fit the requirements of the diverse tasks involved. The management of natural resources over large-scales typifies the challenge of decision-making given complexity (Young 2002; Marshall 2008; Lubell et al. 2010). Part of the challenge is in planning the coordination of logistical operations across space. However, the harder part, even with the best laid plans, is in getting diverse stakeholders who will likely have competing interests to agree to and adhere to any logistical solution. In most real world problems involving multiple stakeholders with competing interests, perfect cooperation is highly unlikely, and instead coordination in making and implementing decisions requires a good deal of contestation (Berardo and Scholz 2010; Lubell et al. 2010). We study the management of plant and pest outbreaks in agriculture, where the logistics of attempting coordinated, science-based eradication is set within the context of: industries and states contesting who will pay for response efforts (Beale et al. 2008); national Governments balancing free-trade (Maye et al. 2012); and the otherwise diverging interests of multiple biosecurity stakeholders (Gilmour et al. 2011; Reed and Curzon 2015; Farbotko et al. 2016). Contestation and coordination are both features of how plant and pest outbreaks are managed, and successful eradication will depend on a better understanding of the roles they each play. We employ statistical network methods and qualitative data to explore where and how contestation happens in a biosecurity response system that is designed to produce rapid, coordinated response to pest and disease outbreaks. In terms of understanding where contestation and coordination happens during an incursion response we first need to define how these two terms are different (Keast et al. 2007; McNamara 2012). For ‘coordination problems’, stakeholders are assumed to display trustworthy and predicable behaviours. Behaviour will be fairly certain where it is stipulated by organisational policy, law, or strong pre-existing social norms. This means that for coordination, stakeholder agreement on what actions to take is assumed and any logistical instructions can be likewise assumed to be followed without objection. Following the ‘risk-hypothesis’, another angle on coordination is that where, in the task of solving complex problems, interacting stakeholders can derive no individual benefits by acting deceitfully, then mutual trust will be a feature of interactions (Berardo and Scholz 2010; Berardo 2014a, b). The real advantage of coordination problems is that the volume and depth of communication can be succinct – there are real transaction costs associated with interacting (see McAllister and Taylor 2015), and so in coordination problems a shared goal can be achieved with lower cost. Where there is contestation in the pursuit of complex goals, there is less intrinsic certainty about stakeholder behaviours and collaboration is required in order to find a solution. Collaboration refers to participatory decision-making where any norms used to govern the decision-making processes need to be developed as part of the partnership (McNamara 2012). In collaboration key behaviours are not stipulated by organisational policy, law, or strong pre-existing social norms – or at least there is no adherence to these (McNamara 2012). And in this context, when negotiating diverging interests, as opposed to in problems of coordination, it is likely that stakeholders can boost their own payoffs by acting selfishly (Berardo and Scholz 2010; Berardo 2014a,b). Trust is needed therefore, and yet cannot be assumed (Gilmour et al. 2011). Whereas in problems of coordination the high transaction costs of interacting can be minimised, in collaboration dense and over-lapping relationships are required in order to build trust and work toward behavioural or operational norms as a precursor to coordination. In this paper we study Australia’s response to an outbreak of the disease ‘myrtle rust’, as a case study into the balance of contestation/collaboration and coordination in plant pest and disease biosecurity. The ultimately unsuccessful attempt to eradicate myrtle rust was hotly contested, involving more than 250 stakeholders from all states (and territories) of Australia across local, state and national scales. Recent studies explored the structural patterns of how stakeholders with different interests participate in environmental governance, with a view to identifying if those structures predispose, or result from, collaboration or coordination. Such conceptual approaches have been applied to collaborative water governance (Lubell et al. 2014; Berardo 2014a; Berardo and Lubell 2016), climate change planning (McAllister et al. 2014), plant biosecurity (McAllister et al. 2015a), and regional-scale conservation (Guerrero et al. 2015a,b). Following these studies, we conceptualise our network as a set of organisational stakeholders who are connected to each other indirectly via mutual participation in the set of committees and working groups (policy forums, see Fischer and Leifeld 2015) which organised the response and subsequent management programs. Where previous studies have focused on stakeholders as the unit of analysis, our study focuses on the working groups and committees (thereafter called forums) that form during response to biosecurity outbreaks. We test whether forums within our networks were associated with different structural characteristics depending on whether their role was to produce high-level decisions, make plans for on-the-ground action, or implement actions on-the-ground. Additionally, we used qualitative interviews to provide contextual data on stakeholder behaviours. Our study contributes to the development of emerging approaches for studying the multi-scale networks for environmental governance. It also adds new empirical dimensions to discussions on how coordination and collaboration differ (Keast et al. 2007; McNamara 2012), and to debates surrounding how each express themselves across networks in response to the uncertainties faced by diverse stakeholders (Lubell 2013; Berardo 2014a,b; McAllister et al. 2015b). Australian management of plant pest and disease outbreaks that meet criteria regarding impact and likelihood of eradication fall under the Emergency Plant Pest Response Deed (thereafter called the ‘Deed’) – a legally binding agreement between all Australian governments (national, state) and participating national plant industry bodies (Biosecurity Emergency Preparedness Working Group 2012; Plant Health Australia 2005, 2011, 2013, 2015a,b). Ratified in 2005, the Deed covers the management and funding of responses, and formalises the roles of plant industries’ participation in decision making. The Deed also provides guidelines for response procedures, outlines the phases of response, and the key roles and responsibilities of industry and government during each phase. One result of the Deed is the rapid establishment of a generic organisational structure as incursions occur. This structure has two functions: (1) provision of strategic policy and direction, and (2) planning and implementation of operational activities (Biosecurity Emergency Preparedness Working Group 2012). This structure includes the formation of policy forums – debriefings, working groups, standing committees, expert panels, and existing high-level committees where the response became an agenda item. We conceptualised the structure of response as a set of forums, where the characteristics of various forums range in organisational leadership, size, and decision-making mode (Fischer and Leifeld 2015). These forums also cut across local to national scales (Figure 1). Even though a generic structure will apply to all incursions, the specifics of who participates where in a response will depend on which stakeholders are most relevant given the pest or disease, and how those in charge of any response interpret nuances of the Deed. Furthermore, across the various participants, the motivations for participation will be diverse (Fischer and Leifeld 2015). In summary, even though each response has a generic organisational structure under the Deed, each response will have unique structural patterns of stakeholder participation (e.g. McAllister et al. 2015a). 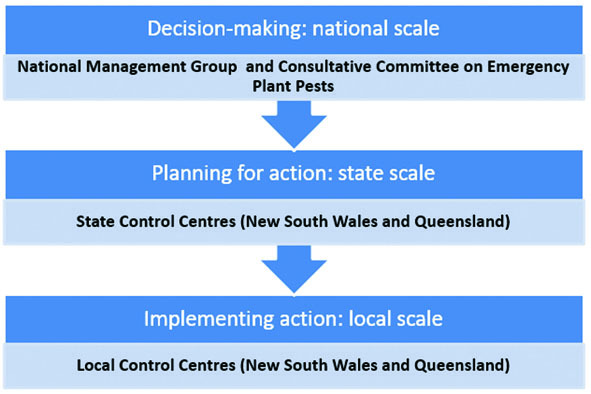 Scales of decision-making and action, as derived from the description of the general procedures, management structure, roles and information flow system for the handling of incursions at national, state and local levels (see below, Plant Health Australia 2015a). As such, this institutional arrangement represents the intended governance response to plant pest and disease incursions under the Deed. Two key national forums handle high-level decision making during an incursion. The Consultative Committee on Emergency Plant Pests (thereafter called the ‘Consultative Committee’) and the National Management Group for Plant Pest Emergencies (thereafter called the ‘National Management Group’) are convened during a response event (Plant Health Australia 2011, 2013, 2015a,b). The Consultative Committee is the key technical body that links all levels of government, industry, Plant Health Australia and the National Management Group during an emergency response. Mandated representation includes all state chief plant health managers, a representative from the national biosecurity agency and a non-voting representative from Plant Health Australia (http://www.agriculture.gov.au/plant/health/committees/ccepp). Affected industry representatives are invited to provide two members who have voting rights on decisions. A person with relevant health, environment and amenity flora expertise may also be invited to attend committee meetings if appropriate to the emergency. The Consultative Committee coordinates the national response to a plant pest or disease, advises the National Management Group on emergency related issues, determines if the incident requires an emergency response, makes recommendations to the National Management Group on whether a Response Plan (and details of the plan) is required, considers regular reports on the progress of the Response Plan, and develops consensus for further actions. It also determines and advises the National Management Group when a pest or disease has been eradicated, and advises the National Management Group on economic and financial aspects of a response. The Consultative Committee may appoint a Scientific Advisory Panel if additional information or advice is required to assist in deliberations. The National Management Group is responsible for approving Response Plans, which include determining indicative budgets, cost-sharing arrangements, and setting upper limits on expenditure. It also manages the national policy and resourcing needs of a Response Plan, endorses response determination from the Consultative Committee, and refers matters arising out of a Response Plan to Plant Health Australia. The National Management Group receives technical advice and updates from the Consultative Committee. A State Control Centre is established in the state with the incursion, normally in the head office of the responsible government department. The State Control Centre leads the design of the Response Plan for coordination of activities across the state. These Response Plans need to be approved by the National Management Group (above, Biosecurity Emergency Preparedness Working Group 2012). The State Control Centre does not become involved in the implementation of on-ground-activities, but takes charge of (1) managing the response (eradication/control) campaign in accordance with the relevant legistation, policies and PLANTPLAN strategies and procedures with due consideration of the economic, commerical and social implications of all actions taken; (2) providing accurate and timely advice to the government (minister), Consultative Committee, the public, all department staff, emergency management agencies and industry; and (3) establishing ongoing consultative and reporting arrangements between the State and the Local Control Centres (Plant Health Australia 2015a). A Local Control Centre is established in the region where the incursion has been detection. The Local Control Centre is guided by the objectives established by the State Control Centre, and has primary responsibility for conducting and supporting all operational activities in its geographical area (Biosecurity Emergency Preparedness Working Group 2012). It may be necessary to establish more than one Local Control Centre, depending on the complexity or extent of the response. The Local Control Centre deploys teams to undertake tasks in the field, including (1) investigation – sample collection to enable diagosis or identification of a pest or disease and/or surveillance tasks to determine the extent of a pest or disearse spread; (2) area movement and security – enforcement of quarantine, possibly including check-point operations; and (3) infected/infested premises options – tasks associated with managing containment and treatment or eradication of a pest or disease at an infected/infested property or place (Biosecurity Emergency Preparedness Working Group 2012). Where stakeholders interact in order to commit to solutions or actions relating to defined problems, individuals can gain the most by acting purely in their self-interest (i.e. uncooperative) (Berardo and Scholz 2010). This does not mean individuals will always act uncooperatively – it means the potential for uncooperative behaviour is higher. When there is greater potential for uncooperative behaviours interactions either need to (1) allow time for repeated group interactions such to develop shared-norms and trust, or (2) limit interactions only to a clique of stakeholders where shared-norms and trust already exist. Either way, this suggests a need for bonding capital in which networks is defined by dense and over-lapping relationships (Table 1). Bonding capital generally has high transactions costs, but where negotiation, trust and consensus building are critical as a precursor to coordination, then bonding capital is normally required. Mapping bridging or bonding against network configurations in bipartite networks (circles representing organisational actors; squares representing policy forums). Bridging capital, on the other hand, underpins access to additional, and therefore valuable, resources through unique relationships to distant parts of a network (Burt 2005; Putnam 1993). With bridging capital, information such as instructions relating to coordination, can be rapidly dispersed across a network (Carlsson and Sandstrom 2008). The benefits of bridging capital however can only be yielded in cases where the risks of encountering uncooperative behaviours are low, which generally requires that individuals in such interactions have little to gain from uncooperative behaviour. These are ‘coordination’ problems, and are common where stakeholders largely share the same agenda (Berardo and Scholz 2010). The Deed was conceived as an integrated system for the coordination and planning of actions across scales, and to explicitly take a degree of contestation out of cost-sharing negotiation. We hypothesise however that contestation is not only a feature of biosecurity response, but that in the forums where contestation takes place the patterns of participation are predisposed to have bonding capital. In forums where actions are implemented, bridging capital will be relatively more common. In other words we expect our analysis to show that the patterns of participating in biosecurity response forums will look very different for nationally compared to locally scaled forums. Using the Australian response for the myrtle rust incursion as our case study (below), we use qualitative data to probe the nature of contestation in the nationally scaled forums, and across local, state and national forums we collect and analyse network data to determine if bonding and/or bridging capital is present more or less than can be explained by chance (Table 1). We coded the forums by scale and use an Exponential random Graph Model (Frank and Strauss 1986; Wasserman and Pattison 1996) to test which patterns dominate at which scales. We expect that contestation is an element of some, but not all, parts of the Australian biosecurity response system, and that the patterns of stakeholder participation in response will be denser and with greater over-lapping relationships in the parts of the response network at national scales where decisions need to be negotiated (bonding capital). At local scales, where plans are implemented more or less at face value, patterns of participation will have fewer over-lapping interactions with other stakeholders (bridging capital). Myrtle rust was first detected in April 2010 on a native flower plantation in New South Wales, a state jurisdiction in eastern Australia (Carnegie et al. 2010). To date, all attempts to eradicate and contain myrtle rust in Australia have been unsuccessful. Our data show how the Australian biosecurity response system structured it’s attempted eradication and management. Plant pathology diagnosis described this rust as a new species Uredo rangelii and although regarded as a member of the Puccini psidii ensu lato complex (Simpson et al. 2006; Carnegie et al. 2010), it was considered to be morphologically distinct from Puccini psidii.Puccini psidii, commonly known as guava/eucalyptus rust, was first detected on guava in Brazil and has long been considered a significant threat to Australian Eucalyptus and other myrtaceous plant industries and ecosystems (Grgurinovic et al. 2006; Glen et al. 2007; Pegg et al. 2014). As such the Australian Nursery and Garden Industry was particularly concerned due to risks to nursery production, timber, and cut-flower production (Nursery and Garden Industry Australia 2012). The diagnosis of myrtle rust triggered an emergency response under the Deed (23 April 2010), led by the New South Wales state government. At a Consultative Committee meeting (27 April 2010) it was decided that the initial response would include delimiting surveys in the suspected target area to decide whether it was technically feasible to eradicate. As it was determined that the rust had likely been at the reporting property for several months, and that infected plant material had been shipped to the Sydney Flower Markets during this time, a meeting of the Consultative Committee on 30 April 2010 deemed that myrtle rust was not technically feasible to eradicate, and the national support for the response was stood down. However, on 6 May 2010 the Consultative Committee reconsidered this decision, thereafter providing New South Wales with support to suppress the rust and delimit the infected area. During this time the National Biosecurity Committee convened and developed a National Management Plan for myrtle rust to identify immediate and longer term management actions, including clearly distinguishing between U. rangelii and P. Psidii; assessing the impact of rust on the native environment; conducting host testing; and determining the potential geographic spread of the rust (see Carnegie and Cooper 2011 for summary of stages of the response). Graphical representation of the multi-level (bipartite) network data, with squares/circles showing forums/individuals; N, S and L show national, state and local forum scales; network’s (p-clique) core lightly-shaded for graphical purposes only. Participation across various forums (working-groups, committees). The key conceptual approach of our analysis is in looking within networks to identify what sub-patterns (so called configurations) occur more or less than could be expected by chance alone. Over or under representation of certain configurations can then be used to infer the presence of important social and political processes (e.g. Bodin and Tengo 2012; Berardo 2014a; Lubell et al. 2014; McAllister et al. 2014; Guerrero et al. 2015a,b; McAllister et al. 2015a,b; Bodin et al. 2016; Bodin et al. in press). To statistically identify over or under representation of configurations we used an Exponential Random Graph Model (ERGM), a statistical network methodology (Frank and Strauss 1986; Wasserman and Pattison 1996). ERGMs assume networks are the result of a stochastic process. Any observed network is treated as a single observation which can be compared to a distribution of all possible networks with a core set of identical characteristics (e.g. number of nodes and ties) (Robins et al. 2007). In this way the observed frequency of configurations can be statistically compared to their potential frequency based on other possible networks reconfigurations, assessing whether configurations are observed in a network more or less frequently than could be expected by chance alone. ERGMs allow for statistical inferences to be made without the need for multiple networks for comparison. ERGM also account for nested configurations – for example, from Table 1, with each ‘bonding for collaboration’ configuration there are potentially two nested ‘bridging for cooperation’ configurations. By assessing frequencies of configurations relative to other potentially nested configurations ERGMs progress on conceptually comparable approaches that focus on frequency counts (Bodin and Tengo 2012). Assessments also need to control for the general level of activity displayed by each scale of stakeholder. This ‘baseline activity’ can also be interpreted as a measure of how active stakeholders have been in the response network. ERGMs are a statistical model and accordingly estimates a coefficient for each configuration included in a model. These coefficients reflect the chances of observing ties. The signs of the coefficients quantify if configurations are observed more (positive coefficient) or less (negative coefficient) than can be expected by chance alone, and the t-scores of the coefficients quantify if this discrepancy between observation and expectation is statistically significant (Wang et al. 2009). One of the limitations of ERGMs is that the algorithms for estimating coefficients frequently fail to converge. For this reason ERGMs tend to be parsimonious, including only the most important configurations for understanding foci questions. After fitting the model, additional configurations can be examined using a residual structural effects approach (e.g. see Lubell 2015; McAllister et al. 2015b). Here, a fitted model is used to simulate a sample of networks. The distribution of selected configurations across the simulated networks can then be compared to the counts from the observed network. If the observed count of configurations is statistically greater when compared to the simulated networks, it can then be concluded that the configurations are more abundant than can be explained by fitted model, adding evidence that there are more of these configurations than can be expected by chance alone. Standing members, invited members and members representing industry involved in the Consultative Committee during the myrtle rust response were identified from the Consultative Committee minutes. Members were approached and 12 of these agreed to be interviewed. Three members of the Scientific Advisory Panel were also interviewed and all members of the National Management Group were approached with four agreeing to be interviewed. Interviews were taped if permission was granted and/or extensive notes were taken during the interview. Interviewees were asked about their perspective on how the myrtle rust response was managed by the forum in which they held membership. Specific questions probed how well different types of information was communicated and translated to make decisions; and how members of each forum negotiated and committed to sharing responsibility for biosecurity actions and decisions. Interviews were transcribed and imported into NVivo for coding and analysis. This analysis was informed by grounded theory to enable generic themes and relationships to be identified and understood from the interview data (Boyatzis 1998). Themes were focused around stakeholder categories (e.g. government, industry) and then related using axial coding that focused on forum variables (e.g. Consultative Committee, Scientific Advisory Panel, National Management Group) that led to the identification of the nature of contestation (e.g. uncertainty, trust, etc.) surrounding the myrtle rust response. The categories of contestation were then related to each policy forum (Consultative Committee, Scientific Advisory Committee and National Management Group). This enabled the nuance of issues around contestation to be distilled (i.e. did a lack of trust result from uncertainty around the data, or the ways in which decisions were made, or implemented) and related to the purpose and mandate of each policy forum. Coding also highlighted how and why members participated in each policy forum and categorised perspectives on the advantages and challenges identified from participating in these forums. Our Exponential Random Graph Models contained six fairly simple bipartite configurations (Table 3). Three configurations neither specified type/scale of actor nor forum. These were: an activity configuration; a star configuration with one forum and two actors; and, a star configuration with one forum and three actors. The remaining three configurations were activity configurations accounting for ties between actors and national, state and local forums respectively (noting in this analysis actors were not coded). Such ‘simple’ configurations and/or configurations without coded nodes are important because they provide a control measure to help make unbiased interpretations of the more complex and often nested configurations (similar to an intercept term in a simple linear regression model). Indeed it is problematic to interpret any configurations that are not controlled for by a simpler configuration. We can for example interpret the positive sign on the national-activity configuration (0.832/6.3534***), but only because it is controlled for by the generic activity configuration. Hence we can say that the national-activity coefficient shows nationally-scaled forums are associated with significantly more ties than could be expected based on chance alone, given the number of generic actor-forum ties across the network. Exponential Random Graph Models and goodness-of-fit analysis (GoF). */**/*** refer to 90, 95 and 99% significance. In model  all ties are treated as random. In model  19 ties that related to statutory participation of certain roles into the response (e.g. Chief Plant Protection Officer, Local Control Planner etc.) were fixed. Goodness of fitness are based on a sample of 2000 random networks. Multi-level networks are notoriously hard to solve using Exponential Random Graph Models. While our primary interest was to test the over or under representation of scale/type-specific forums indicating bonding or bridging (see Table 1), extensive testing failed to produce any models that could adequately include such configurations. Hence, in order to assess the over/under representation of forum specific configurations we relied on goodness-of-fit (Lubell et al. 2014; McAllister et al. 2015b). The fitted Model was used to simulate 2000 random graphs (using the package MPnet Wang et al. 2014) and simulated counts of configurations were compared to those observed. For the configurations already included in the Model, the subsequent goodness-of-fit provided a quality check. Given the included configurations are used as the basis for simulation, the simulated and observed counts should be statistically identical, and they are (Table 3, Column ). For the forum specific configurations showing bonding and bridging (Table 1), having significantly higher observed counts than the simulated networks provides evidence configurations occur at levels higher than could be expected by chance (after controlling for those configurations in the Model). Our results show the bonding/collaboration configuration for national forums is observed significantly more often than expected by chance. No other configurations were significant (Table 3, Column ). In total 259 actors participated across the 12 forums in the response to myrtle rust. Many actors participated as part of their statutory roles. ERGMs assume stochasticity, and therefore we ran a second model with fixed ties where 19 known statutory roles made participation statutory in certain forums (Table 3, column [3–4]). The results are broadly consistent, the only exception being the residual analysis shows bonding/collaboration configurations for the state forums became weakly, significantly positive (Table 3, column ). Our hypothesis related to the balance of coordination and collaboration across the various policy forums for biosecurity. The ratio of observed collaborative to coordinating structures is nearly five times higher for nationally-scaled forums compared to those at the local scale (see Table 3). Yet, we failed to find statistical evidence to show that at local scales, where plans are implemented more-or-less at face value, networks exhibited interactions associated with the socially cheaper task of coordination (bridging-capital, low transaction-costs). However, at national scales, where biosecurity response policy forums are designed to make higher-level decisions, stakeholder interactions were associated with denser overlapping ties signifying collaboration (bonding-capital, high transaction-costs). Overall we conclude partial support for our hypothesis, with some structural evidence of contestation in the national decision-making forums. Without stronger quantitative evidence, the qualitative evidence is particularly important, and we use this to explore the nature of contestation in the national decision-making forums, and how this evolved over the course of the Australian response to the myrtle rust incursion. Analysis of the in-depth qualitative interviews found that the Consultative Committee and National Management Group participants engaged in some contestation, which is a signature of collaborative processes rather than straight coordination (see Keast et al. 2007). Group members experienced uncertainty, but also reported exploitation of uncertainty in order to contest key decisions during the myrtle rust response. Uncertainty surrounding stakeholder interactions were underpinned by multiple and competing interests. While contestation appeared focused on Deed processes and the classification of information, it was underpinned by how subsequent decisions distributed the costs and benefits across jurisdictions and stakeholders. The qualitative analysis identified two dimensions of how uncertainty contributed to risk in stakeholder interactions: (1) uncertainty surrounded the accuracy of the information used to assess biosecurity risk; and (2) there was ambiguity in the process by which forums negotiated decisions and how key responsibilities were assigned. These interview findings were notable given the role of the Deed is to provide response procedures for coordination of response action. Elements of mistrust and a lack of shared norms that can exist in collaborative forums were evident from the interview data. Scientific authorities expressed caution in using the technical advice being provided to the Consultative Committee, while industry representatives questioned if their input really impacted final decisions. For example, industry representatives were told their input was valued, but they expressed the concern that their input was not really incorporated into the emergency response’s risk assessments. Furthermore, delays in declaring the myrtle rust outbreak as an ‘emergency’ were seen by some as a lack of government commitment to share the costs of the response, adding to mistrust. “…it was deliberately put forward that what we had in Australia was not eucalyptus rust that it was a different strain, it was given a new name called myrtle rust, basically I assume the intention was ….. to down-play the significance of the incursion in Australia”. Under the Deed, how the costs of responding to incursions are shared across governments and industry is dependant partly on whether or not the incursion is deemed eradicable, or alternatively something that requires on-going management. It is perhaps not surprising then that the Committee participants debated whether or not eradication was technically feasible. An initial decision by the Consultative Committee that eradication of myrtle rust was not technically feasible was subsequently contested by industry groups. Land surveys also suggested that the rust did not seem to be spreading, and this was used to support the case for a high upfront investment in eradication. Ultimately the National Management Group reassessed its earlier decision, agreeing to shift from management to contain the disease, into emergency response mode seeking eradication. Many of the government and industry representatives on the Consultative Committee interviewed for this study noted that trust in the process had been tested during this particular period in the response, despite the intention of the Deed to promote cooperation. “We came into the process later on … much of this was because various groups got together to highlight what a serious issue this was”. New participants joining the response in later stages introduced new thinking, notably the view that environmental impacts of the rust were previously underestimated in the initial cost-benefit analysis. For example, when the Department of the Environment ran a workshop on the myrtle rust, many local environmental groups added new perspectives and interests – namely that eucalyptus trees were important for a range of conservation issues but also that there were many cultural, social and economic services that would be affected by this rust. “there were a few individuals who set up alliances outside the forums … this made it tricky for those working through a formal way to reach consensus”. A key challenge for better environmental governance is moving beyond the mantra of collaboration as being a universal good, toward a better understanding of how to balance the different agendas and vested interests and behaviours which collectively shape policy outcomes (Lubell 2015). In 2005 Australia replaced a fairly ad-hoc state-based plant biosecurity response system with the nationally coordinated Deed (Beale et al. 2008). This new system sought to pre-determine many of the negotiations relating to emergency responses that had previously slowed down on-ground actions (e.g. who pays, Beale et al. 2008). In other words, the Deed sought to reduce the volume and depth of communication required in attempts to eradicate pest and disease outbreaks in agriculturally significant plant industries. In this way the Deed anecdotally appears to shift the response along the continuum toward being a ‘coordination’ problem, but by broadening the set of stakeholders involved, paradoxically moved the system toward collaboration in other ways (McAllister et al. 2015a). In fact such paradoxes and complexity are mirrored in countless examples of environmental governance problems globally – from irrigation for agriculture (Edelenbos and van Meerkerk 2015; Hoogesteger 2015; Margerum and Robinson 2015), through to policies around environmental and industry trade-offs (Robinson et al. 2011; Frey and Berkes 2014; Prager 2015). Across such examples, moving beyond the crude mantra of collaboration being a universal ‘good’ requires a better understanding of where collaboration sits alongside other forms of interaction. Our research shows how at national scales there remains, at times, a high degree of contestation that detracts from the emergency response roll-out and thereby delays the formation of plans and implementation of action on-the-ground. This adds some support to our hypothesis, and is consistent with research that shows dense network structures form in parts of policy networks where stakeholders perceive there to be aspects of risk and uncertainty in their interactions with others (Berardo 2014a; McAllister et al. 2014). Our data also highlight that our participants not only experienced uncertainty, but at times exploited it to support their agendas. Bargaining and political power are key elements of decision making (Ostrom 2010; Lubell 2013) and Kruger’s (2016) study of fruit-fly management shows how biosecurity needs to navigate diverse interests which span backyard growers to issues of export market access, and frequently have collective implications. In the context of Australian response to pest and disease incursions, the 2005 reforms changed where and how politics plays a role in biosecurity – they did not remove it – and removing politics from biosecurity seems unrealistic (Robinson and Whitehead 2003; Farbotko et al. 2016). In our case study the response networks, designed for the rapid and relatively cheaper task of coordination, stray into the slower, more expensive task of collaboration. Real world problems with diverse sets of stakeholders will also contain a mix of coordination and collaboration, and effective coordination requires the identification of appropriate spaces for contestation with rules and processes that embrace and expedite those disputes in a constructive manner. While above we examine differences between decision-making, planning and implementation for responding to plant pest and disease outbreak, they are all part of the same system. Collective action is where natural resources are managed by communities and stakeholders who play a central role in shaping the rules that govern how those resources are used. For pure collective action problems, the networks between resource users need not only to coordinate management and use across scales, but also foster the creation, maintenance and functioning of the rules. Where resources are managed by centrally created, and well maintained and enforced rules, then the networks for natural resource management can be leaner – with lower density networks needing only to coordinate action. Real world problems are neither managed collectively by communities and stakeholders nor centrally managed by governments. Rules-on-paper are locally interpreted and mixed with other behavioural drivers to help shape the rules-in-practice (Young 2002; Ostrom 2005). Not only is there a continuum across problems, but within problems different stakeholders rely on different rules to solve their part of the same problem (Lubell et al. 2010). Reed and Curzon (2015) describe biosecurity governance “as the decision-making that occurs across different groups about biosecurity, which may be expressed through a range of different strategies and other documents”, and this view accords with our analysis of biosecurity response. However, the diversity of how and why stakeholders participate in biosecurity responses has both advantages and challenges. The challenge focuses on the friction introduced where stakeholders hold different perspectives on the ‘facts’ (Farbotko et al. 2016). Diversity of stakeholders also adds transaction costs (see McAllister and Taylor 2015). Yet, greater participation potentially reduces uncertainty by broadening the base of knowledge types used in decision-making (Stringer et al. 2006; Reed and Curzon 2015). Participation also increases legitimacy of decisions, potentially reducing contestation from otherwise excluded groups (Reed and Curzon 2015). Further, although processes for collaboration have a larger transaction cost than those for coordination, collaboration can produce an end-result that is likely to satisfy the management needs of a larger number of stakeholders. As such contestation and conflict can be considered as a positive part of decision-making, whereby different stakeholders use a variety of mechanisms to voice their management concerns (Maclean et al. 2015). The implication here is consistent with other research showing that purposeful consideration needs to be given to a range of mechanisms used to engage with different stakeholders, from farm-gate to policy makers, and at different times (Stringer et al. 2006). The advantages of diversity can only be yielded if enough trust is built into relationships such that the different perspectives can be mutually respected. Our assertion is that collaboration between diverse stakeholders should be fostered via an ongoing process that includes engagement plans tailored to build trust and transparency between actors. The result will be a quicker path to consensus during pest and disease incursion when action is time critical. There are also implications for how to guide targeted capacity development investments, and how to define and refine expected behavioural norms that are more specific to the diversity of key policy forums. Politics is an unavoidable element of biosecurity. In appreciating this it follows that capacity developments should be specific to the needs of actors operating in different parts of the biosecurity system. Where stakeholder interactions relate to coordination then technical capacities remain the core skillset. But where interactions are collaborative, capacity development needs to shift to away from science capability towards the development of skills for negotiation, conflict resolution, and also include ways to manage the expectations of diverse stakeholders. This paper explores the mix of coordination and collaboration using statistical network theory to examine how the type of policy forum impacts on the structures of stakeholder participation. The myrtle rust case study provides the context for exploration and qualitative data were also used to examine stakeholder perceptions of what occurred within key forums during an emergency pest response. We contribute to debates about the role of risk in relationships in shaping how policy networks structure (Berardo and Scholz 2010), and in particular to how sub-networks are structured differently in and across networks as different sets of actors seek to solve distinct sub-problems within broader environment governance challenges (Berardo 2014a; McAllister et al. 2015b). We also help develop new conceptual approaches for analysing networks that focus on the building-blocks, rather than whole of network patterns (Bodin and Tengo 2012; Bodin et al. 2016). There are applied implications of our paper too. The nature of environmental governance in the face of diverse and competing interests is an ongoing and important domain of research (see Lubell 2015). The current Australian institutional response for plant pest and disease incursions is an important case study of this complexity. In such cases, by acknowledging and identifying the different types of stakeholder interactions across environmental governance challenges, any contestation can be constructive and efficient rather than left unmanaged, and hence delays during time-critical operations minimised. 1All de-identified network data, forum codes, and additional codes for actor scale can be provided upon request. The authors would like to acknowledge the support of the Plant Biosecurity Cooperative Research Centre, established and supported under the Australian Government’s Cooperative Research Centres Program. We received ethics clearance through CSIRO’s Social Science Human Research Ethics Committee (#071/12). We also thank two anonymous reviewers, Sophie Peterson, John Austen, Jo Luck, Michael Robinson and Kerry Collins for critical comments, and we are in gratitude to Prof. Garry Robins who advised us on dealing with hard to solve ERGM models! Beale, R, Fairbrother, J, Inglis, A and Trebeck, D (2008). One Biosecurity. A Working Partnership. Canberra: Australian Government. Berardo, R (2014a). Bridging and Bonding Capital in Two-Mode Collaboration Networks. Policy Studies Journal 42(2): 197–225. https://doi.org/10.1111/psj.12056. Berardo, R (2014b). The Evolution of Self-Organizing Communication Networks in High-Risk Social-Ecological Systems. International Journal of the Commons 8(1): 236–258. https://doi.org/10.18352/ijc.463. Berardo, R and Scholz, J. T (2010). Self-Organizing Policy Networks: Risk, Partner Selection, and Cooperation in Estuaries. American Journal of Political Science 54(3): 632–649. https://doi.org/10.1111/j.1540-5907.2010.00451.x. Berardo, R and Lubell, M (2016). Understanding What Shapes a Polycentric Governance System. Public Administration Review 76(5): 738. https://doi.org/10.1111/puar.12532. Biosecurity Emergency Preparedness Working Group. Biosecurity Incident Management System V1.0 – 29 October 2012. Canberra, ACT, Australia: Australian Government Department of Agriculture, Fisheries and Forestry. Bodin, Ö and Tengo, M (2012). Disentangling Intangible Social-Ecological Systems. Global Environmental Change 22(2): 430–439. https://doi.org/10.1016/j.gloenvcha.2012.01.005. Bodin, Ö, Sandström, A and Crona, B (in press). Collaborative Networks for Effective Ecosystem-Based Management: A Set of Working Hypotheses. Policy Studies Journal, https://doi.org/10.1111/psj.12146. Bodin, Ö, Robins, G, McAllister, R. R. J, Guerrero, A, Crona, B, Tengö, M and Lubell, M. N (2016). Theorizing Benefits and Constrains in Collaborative Environmental Governance: A Transdisciplinary Approach for Empirical Investigations. Ecology and Society 21(1): 40. [online] URL: http://dx.doi.org/10.5751/ES-08368-210140. Boyatzis, R. E (1998). Transforming Qualitative Information: Thematic Analysis and Code Development. Thousand Oaks: SAGE. Burt, R. S (2005). Brokerage and Closure: An Introduction to Social Capital. Oxford: Oxford University Press. Carlsson, L and Sandstrom, A (2008). Network Goverance of the Commons. International Journal of the Commons 2(1): 33–54. https://doi.org/10.18352/ijc.20. Carnegie, A. J and Cooper, K (2011). Emergency Response to the Incursion of an Exotic Myrtaceous Rust in Australia. Australasian Plant Pathology 40(4): 346–359. https://doi.org/10.1007/s13313-011-0066-6. Carnegie, A. J, Lidbetter, J. R, Walker, J, Horwood, M. A, Tesoriero, L. G. M and Priest, M. J (2010). Uredo rangelii, a Taxon in the Guava Rust Complex, Newly Recorded on Myrtaceae in Australia. Australasian Plant Pathology 39(5): 463–466. https://doi.org/10.1071/AP10102. Edelenbos, J and van Meerkerk, I (2015). Connective Capacity in Water Governance Practices: The Meaning of Trust and Boundary Spanning for Integrated Performance. Current Opinion in Environmental Sustainability 12: 25–29. https://doi.org/10.1016/j.cosust.2014.08.009. Farbotko, C, MacLean, K and Robinson, C. J (2016). Performing a Plant Biosecurity Emergency: The Generation of Disease Absence and Presence in Northern Australia Banana Plantations. Environment and Planning A 48(4): 771–788. https://doi.org/10.1177/0308518X15623275. Fischer, M and Leifeld, P (2015). Policy Forums: Why Do They Exist and What are They Used for?. Policy Sciences 48(3): 363–382. https://doi.org/10.1007/s11077-015-9224-y. Frank, O and Strauss, D (1986). Markov Graphs. Journal of the American Statistical Association 81(395): 832–842. https://doi.org/10.2307/2289017. Frey, J. B and Berkes, F (2014). Can Partnerships and Community-Based Conservation Reverse the Decline of Coral Reef Social-Ecological Systems?. International Journal of the Commons 8(1): 26–46. https://doi.org/10.18352/ijc.408. Gilmour, J, Beilin, R and Sysak, T (2011). Biosecurity Risk and Peri-urban Landholders - Using a Stakeholder Consultative Approach to Build a Risk Communication Strategy. Journal of Risk Research 14(3): 281–295. https://doi.org/10.1080/13669877.2010.528560. Glen, M, Alfenas, A. C, Zauza, E. A. V, Wingfield, M. J and Mohammed, C (2007). Puccinia psidii: A Threat to the Australian Environment and Economy a Review. Australasian Plant Pathology 36(1): 1–16. https://doi.org/10.1071/AP06088. Grgurinovic, C. A, Walsh, D and McBeth, F (2006). Eucalyptus Rust Caused by Puccini psidii and the Threat it Poses to Australia. EPPO Bulletin 36: 468–469. https://doi.org/10.1111/j.1365-2338.2006.01048.x. Guerrero, A. M, Bodin, O, McAllister, R. R. J and Wilson, K. A (2015a). Achieving Social-Ecological Fit Through Bottom-Up Collaborative Governance: An Empirical Investigation. Ecology and Society 20(4) [online] URL: http://www.ecologyandsociety.org/vol20/iss4/art41/. Guerrero, A. M, McAllister, R. R. J and Wilson, K. A (2015b). Achieving Cross-Scale Collaboration for Large Scale Conservation Initiatives. Conservation Letters 8(2): 107–117. https://doi.org/10.1111/conl.12112. Hoogesteger, J (2015). Normative Structures, Collaboration and Conflict in Irrigation; A Case Study of the Pillaro North Canal Irrigation System, Ecuadorian Highlands. International Journal of the Commons 9(1): 398–415. https://doi.org/10.18352/ijc.521. Keast, R, Brown, K and Mandell, M (2007). Getting the Right Mix: Unpacking Integration Meanings and Strategies. International Public Management Journal 10(1): 9–33. https://doi.org/10.1080/10967490601185716. Kruger, H (2016). Designing Local Insitutions for Cooperative Pest Managment to Underpin Market Access: The Case of Industry Driven Fruit Fly Area-Wide Management. International Journal of the Commons 10(1): 176–199. https://doi.org/10.18352/ijc.603. Lubell, M. N (2013). Governing Institutional Complexity: The Ecology of Games Framework. Policy Studies Journal 41(3): 537–559. https://doi.org/10.1111/psj.12028. Lubell, M (2015). Collaborative Partnerships in Complex Institutional Systems. Current Opinion in Environmental Sustainability 12: 41–47. https://doi.org/10.1016/j.cosust.2014.08.011. Lubell, M. N, Henry, A. D and McCoy, M (2010). Collaborative Institutions in an Ecology of Games. American Journal of Political Science 54(2): 287–300. https://doi.org/10.1111/j.1540-5907.2010.00431.x. Lubell, M. N, Robins, G and Wang, P (2014). Network Structure and Institutional Complexity in an Ecology of Water Management Games. Ecology and Society 19(4): 23. [online] URL: http://www.ecologyandsociety.org/vol19/iss4/art23/. Maclean, K, Robinson, C. J and Natcher, D. C (2015). Consensus Building or Constructive Conflict? Aboriginal Discursive Strategies to Enhance Participation in Natural Resource Management in Australia and Canada. Society & Natural Resources 28(2): 197–211. https://doi.org/10.1080/08941920.2014.928396. Margerum, R. D and Robinson, C. J (2015). Collaborative Partnerships and the Challenges for Sustainable Water Management. Current Opinion in Environmental Sustainability 12: 53–58. https://doi.org/10.1016/j.cosust.2014.09.003. Marshall, G. R (2008). Nesting, Subsidiarity, and Community-Based Environmental Governance Beyond the Local Level. International Journal of the Commons 2(1): 75–97. https://doi.org/10.18352/ijc.50. Maye, D, Dibden, J, Higgins, V and Potter, C (2012). Governing Biosecurity in a Neoliberal World: Comparative Perspectives from Australia and the United Kingdom. Environment and Planning A 44(1): 150–168. https://doi.org/10.1068/a4426. McAllister, R. R. J and Taylor, B. M (2015). Partnerships for Sustainability Governance: A Synthesis of Key Themes. Current Opinion in Environmental Sustainability 12: 86–90. https://doi.org/10.1016/j.cosust.2015.01.001. McAllister, R. R. J, McCrea, R and Lubell, M. N (2014). Policy Networks, Stakeholder Interactions and Climate Adaptation in the Region of South East Queensland, Australia. Regional Environmental Change 14(2): 527–539. [online] URL: http://link.springer.com/article/10.1007/s10113-013-0489-4. McAllister, R. R. J, Robinson, C. J, MacLean, K, Guerrero, A. M, Collins, K, Taylor, B. M and De Barro, P. J (2015a). 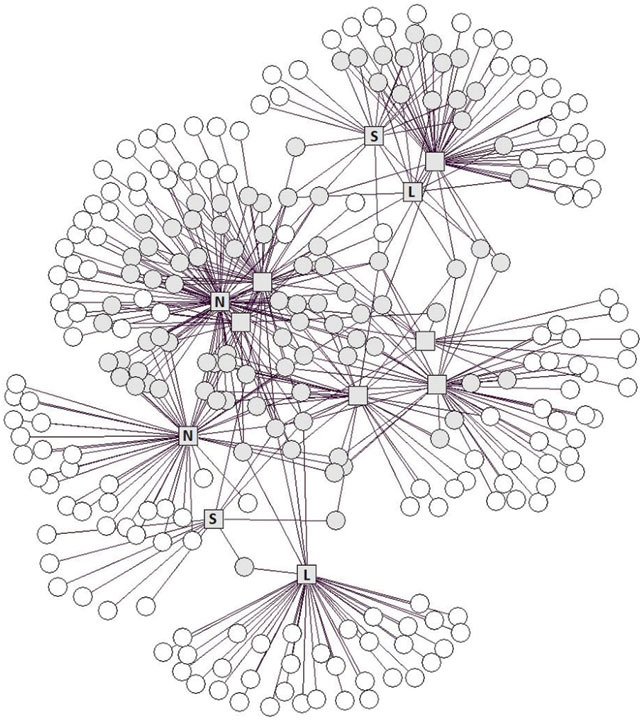 From Local to Central: A Network Analysis of Who Manages Plant Pest and Disease Outbreaks Across Scales. Ecology and Society 20(1): 67. [online] URL: http://www.ecologyandsociety.org/vol20/iss1/art67/, https://doi.org/10.5751/ES-07469-200167. McAllister, R. R. J, Taylor, B. M and Harman, B. P (2015b). Partnership Networks for Urban Development: How Structure is Shaped by Risk. Policy Studies Journal 43(3): 379–398. https://doi.org/10.1111/psj.12103. McNamara, M (2012). Starting to Untangle the Web of Cooperation, Coordination, and Collaboration: A Framework for Public Managers. International Journal of Public Administration 35(6): 389–401. https://doi.org/10.1080/01900692.2012.655527. Moss, T, Medd, W, Guy, S and Marvin, S (2009). Organising Water: The Hidden Role of Intermediary Work. Water Alternatives 2: 16–33. Ostrom, E (2010). Beyond Markets and States: Polycentric Governance of Complex Economic Systems. American Economic Review 100(3): 641–672. https://doi.org/10.1257/aer.100.3.641. Pegg, G. S, Giblin, F. R, McTaggart, A. R, Guymer, G. P, Taylor, H, Ireland, K. B, Shivas, R. G and Perry, S (2014). Puccinia psidii in Queensland, Australia: Disease Symptoms, Distribution and Impact. Plant Pathology 63(5): 1005–1021. https://doi.org/10.1111/ppa.12173. Plant Health Australia. Government and Plant Industry Cost Sharing Deed in Respect of Emergency Plant Pest Responses. Canberra: Plant Health Australia. Plant Health Australia. PLANTPLAN: Australian Emergency Plant Pest Response Plan. Canberra: Plant Health Australia. Plant Health Australia. PLANTPLAN: Australian Emergency Plant Pest Response Plan. Canberra: Plant Health Australia. [online] URL: http://www.planthealthaustralia.com.au/wp-content/uploads/2013/12/PLANTPLAN-5-Dec-2013.pdf. Prager, K (2015). Agri-environmental Collaboratives for Landscape Management in Europe. Current Opinion in Environmental Sustainability 12: 59–66. https://doi.org/10.1016/j.cosust.2014.10.009. Putnam, R. D (1993). Making Democracy Work. Princeton, NJ: Princeton University Press. Reed, M. S and Curzon, R (2015). Stakeholder Mapping for the Governance of Biosecurity: A Literature Review. Journal of Integrative Environmental Sciences 12(1): 15–38. https://doi.org/10.1080/1943815X.2014.975723. Robins, G, Pattison, P, Kalish, Y and Lusher, D (2007). An Introduction to Exponential Random Graph (p*) Models for Social Networks. Social Networks 29(2): 173–191. https://doi.org/10.1016/j.socnet.2006.08.002. Robinson, C. J and Whitehead, P (2003). Cross-Cultural Management of Pest Animal Damage: A Case Study of Feral Buffalo Control in Australia’s Kakadu National Park. Environmental Management 32(4): 445–458. https://doi.org/10.1007/s00267-003-0013-6. Robinson, C. J, Margerum, R. D, Koontz, T. M, Moseley, C and Lurie, S (2011). Policy-Level Collaboratives for Environmental Management at the Regional Scale: Lessons and Challenges from Australia and the United States. Society & Natural Resources 24(8): 849–859. https://doi.org/10.1080/08941920.2010.487848. Simpson, J. A, Thomas, K and Grgurinovic, C. A (2006). Uredinales Species Pathogenic on Species of Myrtaceae. Australasian Plant Pathology 35(5): 549–562. https://doi.org/10.1071/AP06057. Stringer, L. C, Dougill, A. J, Fraser, E, Hubacek, K, Prell, C and Reed, M. S (2006). Unpacking “participation” in the Adaptive Management of Social Ecological Systems: A Critical Review. Ecology and Society 11(2) [online] URL: http://www.ecologyandsociety.org/vol11/iss2/art39/. Wang, P, Robins, G and Pattison, P (2009). Pnet - Program for the Simulation and Estimation of Exponential Random Graph (P*) Models. Melbourne: University of Melbourne. Wang, P, Robins, G, Pattison, P and Koskinen, J. H (2014). MNNet: Program for the Simulation and Estimation of (p*) Exponential Random Graph Models for Multilevel Networks. Melbourne: Melbourne Universtity School of Psychological Sciences. Wasserman, S and Pattison, P (1996). Logit Models and Logistic Regressions for Social Networks. 1. An Introduction to Markov Graphs and p. Psychometrika 61(3): 401–425. https://doi.org/10.1007/BF02294547. Young, O. R (2002). The Institutional Dimensions of Environmental Change: Fit, Interplay, and Scale. Cambridge, MA: MIT Press.